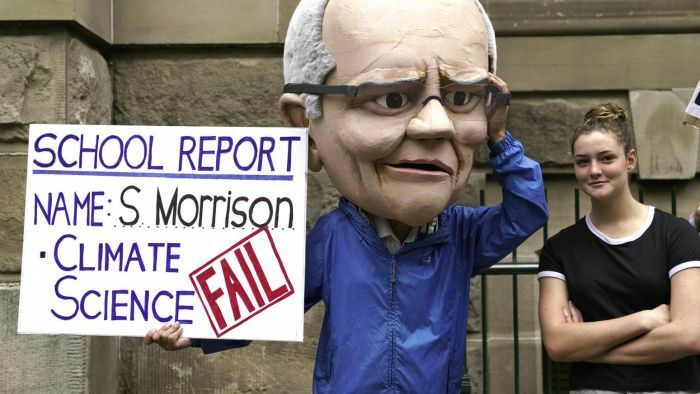 Someone at the school kids’ climate change rally in Sydney on Friday read out the phone number for Bill Shorten’s office over a loudspeaker. The crowd of thousands left a collective message on the Opposition Leader’s voice mail, yelling “BE OUR CLIMATE LEADER” and were being urged to “flood” his office with calls. In another torrid political week of Coalition implosions, the school kids’ actions might not seem the most dramatic. But they are great reality check on how — even on issues where politicians think they might be seen to be less vulnerable than their opponents — their actions hardly satisfy large groups of voters, or soon-to-be voters, who are bucking the trend of the Great Disengagement and becoming politically engaged. Or, for that matter, do they satisfy the pressures at work on businesses and policy makers. If there is one striking thing about the way politics has been moving in the past few weeks, it is that it’s not just a story of the multitude of rats leaving the sinking Coalition ship, or even the north/south divide within the Coalition about climate change and/or coal, but the fact that voters are moving too. That is, it’s not just school kids who seem to be getting galvanised on climate change. Even in Queensland, it seems, the politics of the issue have become complicated enough to force an LNP warrior like Peter Dutton to this week walk away from some of his colleagues over coal. One of the leaders of the coup to oust Malcolm Turnbull over energy policy, but now battling to hold his outer Brisbane seat of Dickson, Mr Dutton said he didn’t agree with the idea that the government should be spending taxpayers’ money building a coal-fired power station. Further south, the Prime Minister had spent the day trying not to mention the C-word at all, referring instead to “a traditional energy source”. The unseemly way individual MPs and ministers have been so spectacularly walking away from their previous positions on climate is something to behold. Somehow it doesn’t seem surprising that the most blatant case of this has involved former prime minister Tony Abbott, given his history of backflips and contortions on climate, going back a decade. But beyond the theatre of politics, there was another, truly significant reminder of just how bizarrely out of step our politics is with reality on climate change with the intervention this week of Reserve Bank deputy governor Guy Debelle. The fact that a central banker — whose primary task is dealing with inflation — felt it necessary to ring the bell on climate change shows how the world, the economy, and of course the environment aren’t waiting, can’t wait, for politicians to get their act together. Mr Debelle’s message was simple: central banks have to forecast the economic outlook; climate change is already proving a large enough disrupter to change the way they work. Reinforcing the message our financial regulator delivered last year at the same forum, Mr Debelle said climate change is equally a systemic risk to financial stability. “The economy is changing all the time in response to a large number of forces,” he told the Centre for Policy Development. “Monetary policy is always having to analyse and assess these forces and their impact on the economy but few of these forces have the scale, persistence and systemic risk of climate change. “The Reserve Bank is saying something that other central banks around the world have also been saying in the past couple of years, notably Bank of England governor Mark Carney who, in 2015, urged action on what he called a “tragedy of the horizon”, arguing that “once climate change becomes a clear and present danger to financial stability, it may already be too late”. Mr Coeure pointed out it was not just managing financial stability that was affected by climate change. “Climate change can be expected to affect monetary policy [the setting of interest rates] one way or the other”, he said. “That is, if left unchecked, it may further complicate the correct identification of shocks relevant for the medium-term inflation outlook, it may increase the likelihood of extreme events and hence erode central banks’ conventional policy space more often, and it may raise the number of occasions on which central banks face a trade-off forcing them to prioritise stable prices over output. Like Mr Debelle, Mr Coeure pointed out that the impact of climate on inflation is hardly a new phenomenon. So while our politicians continue to strut, and pose, and apparently find the only metric that moves them on climate change is the fortnightly Newspoll, everyone else is either getting on with it, or being forced to deal with the reality of it. The question for many central banks around the world now is whether they, or regulators, should actually be intervening in decisions on what assets banks hold: whether the risks of carbon-intensive assets should be penalised, or whether central banks and regulators have a responsibility to help smooth the transition in energy sources that is underway. This last step is a bridge too far for our central bank, given it does not hold the huge reserves of pension assets of some others, and that the regulatory role over the financial system was peeled off to the Australian Prudential Regulation Authority years ago. But the changes are happening anyway, whether it is the massive Norwegian sovereign wealth fund signalling a move out of fossil fuels, or Glencore, Australia’s largest coal miner, putting a cap on its global coal output in response to investor pressure. Politicians might just be starting to listen to voters on climate change. But money, and policy, has already had to move. Laura Tingle is 7.30’s chief political correspondent.